Struggle and Truth of Construction of Vivekananda Rock Memorial – How Eknath Ranade Overcame Politicians to Build the Memorial? 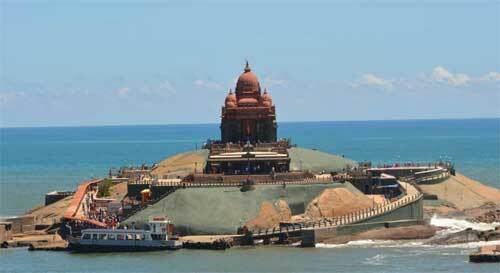 Vivekananda Rock Memorial in Kanyakumari is a world famous monument today and is visited by thousands of people daily. The beautiful memorial in the middle of the sea would not have been possible if not for the single minded devotion and dedication of Ekanath Ranade, who had to overcome politicians, Christian missionaries and narrow-minded bureaucrats of India. Prof. A.V. Narasimha Murthy, former Head, Department of Ancient History and Archaeology, University of Mysore, writes about the struggle undertaken by Eknath Ranade in building the Vivekananda Rock Memorial in the newspaper Star of Mysore (the article was published in 2010 and remove long back). Most of the people do not know or even cannot imagine the trouble, frustration and disappointment experienced by the persons behind the memorial. Like a Trivikrama and Nakshatrika, Eknath Ranade stood by this memorial and ultimately became successful. This story is not only poignant but also brings to light the meanness of the politicians of the contemporary times. People had planned to celebrate the birthday of Vivekananda in 1962-63 by erecting a memorial on a stone on which the Swami sat and meditated. It was also sacred because it was the seat of the footprint of goddess Kanyakumari. As the news spread, a group of Catholics protested that it was the seat of Saint Xavier and opposed the memorial for Vivekananda. Bhaktavatsalam, the Chief Minister of Madras, refused permission to build a memorial to avoid communal clashes. As a compromise, he permitted only a notice Board to be put up stating that Vivekananda meditated here. In January 1963, a stone tablet was put up but removed by somebody and it has not been traced till today. The Madras government did not want to investigate though it knew fully well who the culprits were. Humayun Kabir was the Central Minister for Culture. He was opposed to the erection of a memorial for Vivekananda. Being a shrewd person, he gave the reason of environment and natural beauty to oppose it. He tried to spoil the mind of Nehru by saying that permitting one memorial would be followed by requests for memorials to other Saints of other religions. Somehow he was bent upon thwarting the project. Thus Bhaktavatsalam got support from Humayun Kabir. In the meantime, Ranade came to know that Bhaktavatsalam was a staunch devotee of Shankaracharya of Kanchi. Ranade met Shankaracharya and got his approval for the memorial. With this approval Ranade met Bhaktavatsalam who now agreed to the proposal. This was a great success for Ranade. Hence Basu firmly refused to accept the proposal. Ranade did not budge and told Basu that he will come next week and in the meantime Basu may take a favourable decision. As promised, Ranade came to Basu after a week and asked for his reply. Basu said , 'I have consulted my Communist friends and all of them felt it is a useless project.' Ranade asked if he can put in a word to his wife Kamala Basu. 'She is independent and you can talk to her directly'. Ranade met her also and she helped in collecting just Rs. 1,000. Ranade went to Bhopal to collect funds for the project. D.P. Mishra was the Congress Chief Minister. He had promised to donate Rs. 10 lakh to the project. In the meantime, he came to know that Ranade was a RSS Chief. As he did not like RSS, he withdrew the promised donation. Thus Mishra's narrow political outlook came in for strong criticism by other political parties and general public. Another leader Shukla made use of this instance for his political end. Then Ranade went to Nagaland and met the Chief Minister Sema. His reply was shocking to Ranade. People in Nagaland do not know who Vivekananda was. 'Even I do not know anything about him. How can I give you funds for a cause of which we have no knowledge at all.' Ranade gave some books on Vivekananda to the Chief Minister. Ultimately he gave a paltry sum of Rs. 15,000. More than this small amount what depressed Ranade was the ignorance of people of Nagaland towards a great son of India. The Congress leaders thought that Pandit Nehru would object to this proposal and the memorial would not be erected. Without meeting Nehru directly, Ranade requested Lal Bahadur Shastri to put in a word to Nehru. Shastriji was such as good negotiator that he made Nehru to accept this proposal and also to contribute liberally to the Vivekananda Memorial Fund. Immediately, Bhaktavatsalam changed his stand once he came to know that Nehru was for the proposal. In the meantime, somebody instigated the king of Ramnad that it is appropriate to establish a statue of the king of Ramnad with that of Swami Vivekananda as the king had helped Vivekananda to go to USA. The people of Kerala insisted on that. Karunanidhi objected to this and said that the statue of the king may be established in Rameswaram and not in Kanyakumari. Another trouble arose. The Kanyakumari temple administration committee put forth a new proposal that the footprints of the goddess is on the rock and hence the entire rock belonged the temple and wanted to take control of the entire rock, and the memorial. Ultimately, all these problems were amicably solved and the Vivekananda rock memorial was dedicated to the nation. This is the inner story of the rock memorial visited by thousands of people daily. After the project was approved, Ranade led volunteers to raise funds for construction from donors across the country; state governments and the central Government of India also contributed towards the Rs.12.5 million fund total. The Rock Memorial was completed in 1970, and inaugurated by President of India V. V. Giri on 2 September. 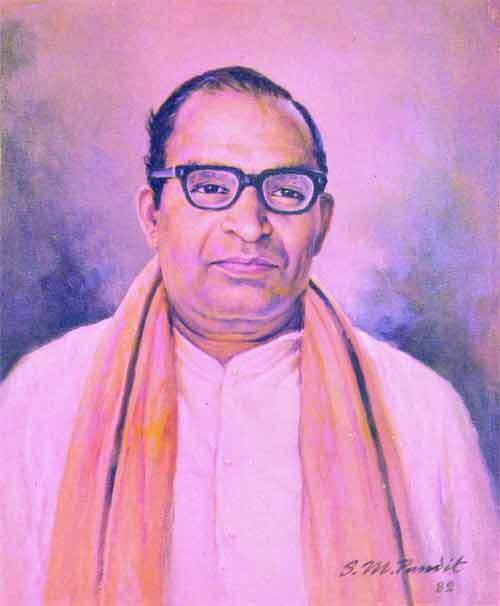 Humble pranams to Eknath Ramkrishna Ranade (19 November 1914 – 22 August 1982) popularly referred to as Eknathji.